McLean, Va., October 14, 2015 — Managing indirect spend is increasingly becoming a priority for well-managed business operations. Corcentric™, a provider of cloud-based financial process automation solutions, today announced it will host its latest Accounts Payable automation webinar “The Benefits of Indirect Spend Management,” on Wednesday, Oct. 21, 2015, at 2:00pm ET/11:00am PT. This free, live event will provide finance and procurement professionals with the latest information on best practices. The goal is to help them control their indirect spend, which is the cost of goods and services that organizations require to support daily in-house business needs. Indirect spend, also known as tail spend, is often an overlooked issue for financial professionals. 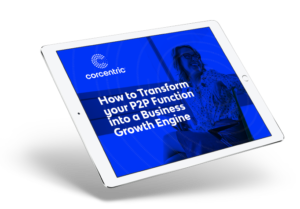 According to research conducted by Proactis in 2012, “For the average company, a 5% savings on tail spend can be the equivalent of a 10% increase in profit.” Corcentric’s upcoming Webinar will explain the current environment and provide real-world examples of how automating indirect spend processes can result in significant cost reduction.